Create the word "PEACE" in your language of choice using our software & vinyl cutter, add it to the map and let's heal the world with our words! And take a vinyl cut sticker with you to add more peace to your own home. This event is FREE and is suitable for children 7 years old to adult. Refreshments will be available. 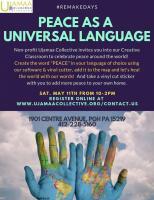 Space within Ujamaa's Creative Classroom is LIMITED so please RSVP. Ujamaa Collective is located inside the One Hope Square Building between the Family Dollar and Hill House Association. Parking for Ujamaa's Remake Learning Day event is available as metered street parking on Centre Avenue, free parking in the Shop n' Save Lot across the street, and on adjacent streets.